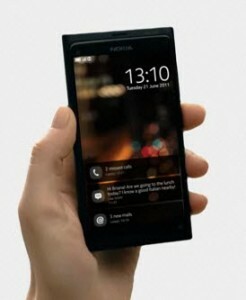 Nokia previewed the long awaited Meego smartphone N9 today at Nokia Connect event that is proceeding in Singapore. The Meego UI exhibited at the revelation looks very promising, and we believe that it’s the best UI Nokia have ever made. One unique feature of the Nokia N9 and Meego is the elimination of the conventional navigation keys. Outstanding Nokia hardware meets the contemporary Meego OS-that’s what the N9 is all about. Check out the specifications and photos of the N9 after the break. Meego OS was announced in early 2010, and everyone was expecting a Nokia device based on it. Although the Nokia Windows phone partnership had caused some misgivings, the final product proves that it worth the wait. 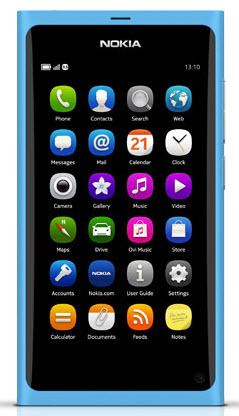 Nokia N9 is based on the Meego OS 1.2. Since there is no home button you have to make use of some special swipe movements to switch through Home screen, apps, open windows, etc. Swiping on the screen edges will take you to the home screen. A similar action at the center slides it through three different home views. The home views include 1) apps, 2) social feeds, call/messaging/email options and 3) open applications running in the background. Coming to the hardware specifications, Nokia N9 is the first device from the company that ships with a 1GHZ processor. There is 1GB of RAM and a dedicated graphics chip to aid the multimedia functions. N9 will be available in 16GB and 32GB storage options. The camera is an 8MP with Carl Zeiss optics that is capable or recording videos @720p HD and at an aspect ratio 16:9. Included Dolby Digital and Dolby mobile technologies will provide admirable audio experience. Another spec that worth a note here is the large, 3.9″ AMOLED display that is enclosed in a Unibody polycarbonate material. The N9 is equipped with an NFC hardware which is believed to have endless prospects in the coming years. And with pre-loaded Angry Birds Magic app- it would be real fun having the NFC on the board. The official specification of Nokia N9 is given here. Nokia hasn’t touched on the price and exact launch date of Nokia N9. And India is not in the list of countries where it would be launched later this year. Final thought: Availability of enough apps in Meego platform is one prevalent question at this point. However, the detailed specifications show that Nokia has included the most needed things in this phone. Since Meego is multi-platform OS, we can expect more developers in the realm and more apps in the future.